Green papaya salad (som tam) is a delicious Thai dish. You might feel intimidated in making it at home, but it is easy to do once you get the ingredients together. Use a recipe for green papaya salad or easy green papaya salad. 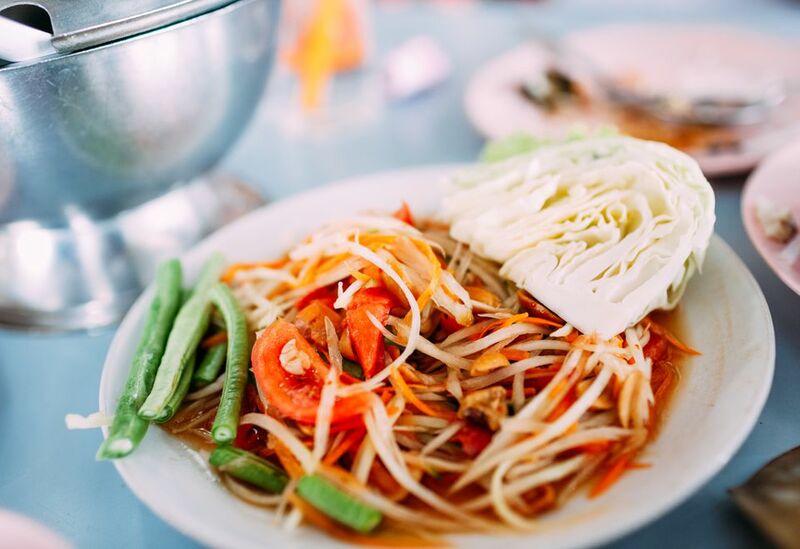 In Thailand, green papaya salad is nearly always eaten with a side of sticky rice, such as easy sticky rice recipe (made in a rice cooker) or a stovetop recipe. You will need a knife, cutting board, and large size grater. Thai cooks also use a pestle and mortar, but you could use a food processor instead. You can try looking for a green papaya at your local supermarket (either two Hawaiian papayas or one Caribbean type). But buying one at an Asian store or market is preferred, simply because it's difficult to tell whether a papaya is green or actually in one of the later stages of ripening. Asian stores and markets sell green papayas labeled as such. Sometimes they are sliced open so you can see it is green inside (the seeds will be white). Slice the papaya in half lengthwise and crack it open. Scrape out the seeds and discard. Then turn over each half and peel off the green skin. Grate or Shred the Papaya. You can use a large-size grater to grate the papaya. In Thailand, they shred it using only a knife, making many long cuts in the flesh, then thinly slicing off the top layer into a bowl, continuing until all of the papaya is shredded. Any remaining pieces can be chopped up into strips with your knife. Note that Thai cooks usually perform an optional step here, bashing the shredded papaya with a pestle to bring out the juice. Another way to do this is to place half the shredded papaya in a food processor and pulse briefly. Mix this with the remaining papaya. Use either a pestle and mortar or a chopper/food processor to mince up garlic, Thai red chilies, and a handful of green beans. The green beans are optional. They help to taper the heat of the chilies. If you don't have them available, this salad is equally delicious without them. Dressing recipes for som tam usually include lime juice, fish sauce (soy sauce is an alternative), brown sugar, honey, and shrimp paste (ground bean sauces or vegetarian stir-fry sauce is an alternative). You need quite a lot of sweetness for this salad in order to balance out the sharpness of the papaya and the lime juice. The dressing should taste sweet with tones of spicy, sour, and salty. Fish sauce, shrimp paste, ground bean sauce, and vegetarian stir-fry sauce are all available by the bottle or jar at Asian food stores. Ground bean sauce is a salty, dark brown sauce made from soybeans. Cut cucumber and green onions into matchstick-like pieces. Slice tomatoes into thin wedges or strips. Chop fresh coriander, fresh basil or mint, and roasted peanuts. Bean sprouts add some extra crunch. It is optional to add protein such as cooked crab meat or shrimp. In a large salad bowl, combine all the vegetables together with the green papaya and spice paste. Pour the salad dressing over and toss well. Top with some chopped/ground peanuts. Taste-test the salad for a balance of spicy, salty, sour and sweet flavors. If you'd prefer it saltier, add more fish sauce, soy sauce, or sea salt. If you prefer it sweeter, drizzle a little more liquid honey. More chili can be added if you want it spicier. If too sweet or too salty for your taste, add another squeeze of lime juice. Pile the salad onto salad plates or into bowls. Top with some more fresh basil and chopped or ground peanuts. Give it a try, and enjoy!